Elite League champions Belfast Giants stay in title contention with an important 3-1 victory over rivals Sheffield Steelers on Saturday. Mark Garside, Adam Keefe and Daryl Lloyd scored the goals for the Giants with Tylor Michel netting a late consolation for Sheffield. 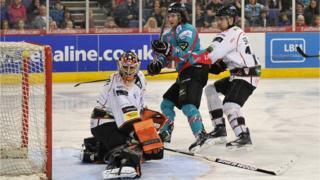 The Giants moved to within two points of pacesetters Nottingham after a 5-3 win over Cardiff Devils 24 hours later.